The consumer durables like AC and fridge will become costly after the recent announcement of hike in service tax from 10-12% and excise duty by the Finance Minister in the Union Budget 2012-13. The industry seems unhappy as the summers approach and that is the time when sales go up. It’s a dicey situation for them now. The last quarter of 2011 was not favourable for consumer durables industry due to the factors like Inflation, hike in petroleum prices and depreciation of Rupee against USD. Due to such reasons the consumer durables industry was forced to increase the prices ranging between 5 to 10%. In this budget we were expecting some relief from the Government in terms of taxation, infrastructure set up, reduce customs duty, encourage domestic manufacturing especially Set Top Boxes , etc! However, not all of it has happened. The increase of excise duty and service tax from 10% to 12 % will straight away affect the end consumers, right from lower middle class to upper class of the society. The customs duty on LCD/LED panels, mobile phones parts has been removed and another 5 years extension for weighted deduction of 200% on R&D expenditure for an in-house facility are surely welcoming decisions, but this has been overshadowed by the excise duty hike. In the Indian consumer durables industry, majority of the products are still being manufactured in India; so the growth of durables industry would be a challenge. We have to wait and see the impact on prices from manufacturers before we take any pricing decision on electronic gadgets. But as far as possible, we will try to keep prices low. There are clear inflationary implications of Union budget 2012-13. Also, a clear roadmap for GST and DTC implementation that the industry was keenly looking forward to has not materialised. Strong shot in the arm for consumer sentiments was expected. With inflation and fiscal consolidation being the key themes, Union Budget 2012-2013 was expected to help consumer sentiment and control inflation but it doesn't fulfill that. While the raise in income tax exemption should provide some increase in disposable income for consumers, it will be offset by the hike in Central Excise Duty from 10% to 12%. The industry is already struggling with steep dollar exchange rate and various input cost increases over the last year. Rolling back of financial stimulus package will affect consumer sentiment. Announcement of APA (Advance Price Agreement) is a welcome step, as this is at least a positive step toward reduction in transfer pricing disputes. Last but not least, customs duty exemption on LCD/LED panel and part of memory card of mobile phones is definitely a welcome step, though it will only partly affect our costs. The benefits announced for key sectors like infrastructure, agriculture and education are bound to improve the overall economic scenario. However, the budget does not bring any relief to the consumer electronics industry, which has been reeling under the impact of rising input costs and rupee depreciation in recent times. 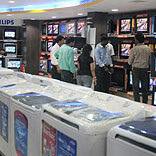 The rise in excise duty may lead to an increase in prices of consumer electronics products.